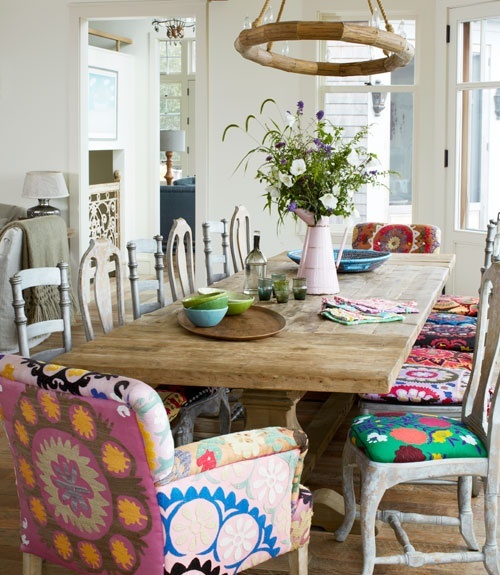 How adorable and stylish is this dining room? I spotted it on Pinterest (where else?!) and it immediately looked Inspiration Snapshot worthy! I love the mix of chair styles, the upholstered host and hostess chairs (a favorite of mine in dining rooms), and the super cute chair seat fabric in all different colors and patterns. The rustic natural wood table is a fabulous piece that really anchors the room. And what about that cool chandelier?! It feels so fresh and cheerful here! What else are you noticing about this space?